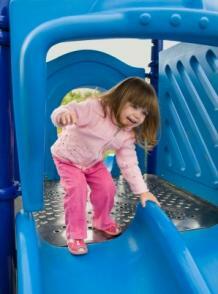 Infant and toddler playground equipment can last for many years if taken care of properly. When choosing equipment for children, however, keep in mind that there are several safety issues that must be considered. Children are naturally attracted to playgrounds. The brightly colored swings, tunnels, and slides just beckon kids to come have fun. Elaborate infant and toddler playground equipment can be expensive, but you may be able to find some more affordable alternatives. End of season sales-You can find significant markdowns on playground equipment at end of season sales, particularly at the end of the summer. Clearance prices could be cut as much as 75 percent on some items, but keep in mind that selections will be limited. Watch your local stores, such as Toy R Us and Wal-Mart for price cuts. Consignment sales-Whether you have a favorite consignment shop in your town or a consignment sale is hosted a couple of times a year, you can sometimes find playground equipment for a fraction of its original cost. Yard sales-Yard sales typically abound in the spring and summer months as families clean out their houses and yards and offer shoppers some awesome deals. You may be able to find gently used playground equipment and other cheap baby stuff in your neighborhood or across town. Whether or not your children's playground is public or private, you'll need to pay attention to a variety of safety issues associated with infant and toddler playground equipment. There are several resources you can access to find more documentation and recommendations on choosing and maintaining safe playground equipment. For example, the International Play Equipment Manufacturers Association offers third-party product certification services for public playground equipment and of course the U.S. Consumer Product Safety Commission maintains a list of requirements as well. The most important safety precaution you can take for your infant or toddler is to provide close supervision. This includes a basic inspection of the equipment that children will use. Give a cursory once-over inspection before your child even enters the play area if possible. Continue to monitor your child as he or she plays on the equipment. Be sure your child wears appropriate footwear. Be conscious of your child's clothes. Remove any clothing that has strings, holes, etc. that could get caught on equipment. Don't allow your child to play on the equipment in any manner other than the intended type of play. Don't allow your child to wander away from the playground. Hardware-Be sure that all hardware is properly fastened, covered, and smooth to avoid cuts and other injuries. Metals-Bare metals can become extremely hot during summer months and cause burns to tender skin. Check to see that playground equipment uses safer alternatives, such as wood, plastic, or coated metals. Paints-Paints should meet the CPSC's restrictions on lead-based finishes. Paint should also be in good shape to prevent rust and other corrosion. Woods-While woods should be treated unless they are naturally rot or insect-resistant (such as cedar), wood treatments should not contain pesticides. Design-The playground's design should adhere to strict safety regulations that guard against strangulation hazards, head entrapment, tripping hazards, and the prevention of minor and more serious lacerations. Playground equipment should be inspected periodically, and repairs should be taken care of as soon as a possible problem is discovered.